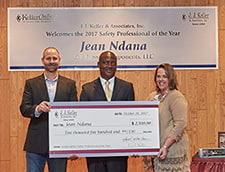 Neenah, WI — J. J. Keller & Associates, Inc., the nation’s leading provider of regulatory, safety and compliance solutions, has announced the winner of the J. J. Keller Safety Professional of the Year (SPOTY) award. 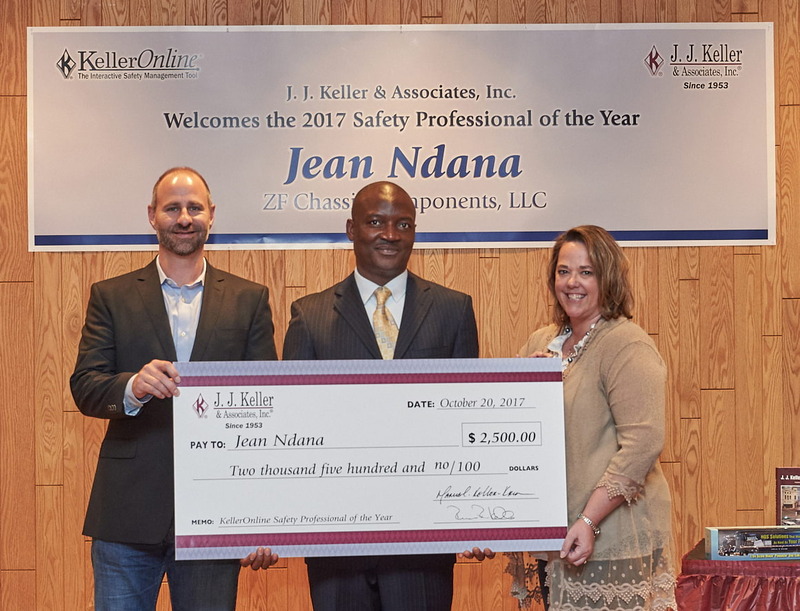 Jean Ndana, environmental, health & safety manager for ZF Chassis Components, LLC., of Lapeer, Mich., accepted the award during a ceremony held at J. J. Keller headquarters on October 20, 2017. An 18-year veteran in safety, Ndana has spent the past five and a half years with ZF Chassis Components, LLC., a Tier 1, multinational automotive supplier. His comprehensive safety program relies on true-to-life health and safety simulations; employee-led, cross-functional safety teams; and frequent open forums. Also recognized but not in attendance were second-place award winner Cory Lorincz, director of safety at Volunteer Express, Inc., of Nashville, Tenn., and third-place award winner Darcie Holloway, safety manager at Best Sanitizers, Inc., of Walton, Ky. Winners of the award received cash prizes, plaques, certificates and complimentary J. J. Keller® KellerOnline® subscriptions. Since 2002, J. J. Keller & Associates, Inc. has recognized safety professionals from across the country who have demonstrated unique, engaging and effective approaches to their safety programs. Since its beginning as a one-man consulting firm in 1953, J. J. Keller & Associates, Inc. has grown to become the most respected name in safety and regulatory compliance. Now over 1,400 associates strong, J. J. Keller serves over 600,000 customers — including over 90% of the Fortune 1000® companies. The company’s subject-matter expertise spans nearly 1,500 topics, and its diverse solutions include training via online courses, streaming video or DVD; online management tools; managed services; consulting services; online and print compliance manuals and instructional publications; ELogs and mobile technology, forms and supplies. Safety professionals rely on J. J. Keller’s in-house expertise and wide selection of products and services to reduce risk and improve regulatory compliance, performance management, and operational efficiency. For more information, visit JJKeller.com.